On the return trip from Nam’s hometown of Mahasarakham to Bangkok, we made our first stop at Buri Ram (the “City of Happiness”). It’s located in a quiet province which was an important district of the Khmer empire during the Angkor period, and contains numerous Khmer ruins. There are three of four very well-preserved Khmer temples, and we visited one at the Phanom Rung Sanctuary. 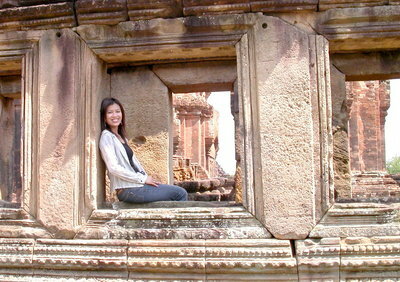 It was built during the 12th century and is set on top of Phanom Rung Hill. According to the pamphlets I picked up at the museum, the sanctuary is dedicated to the God Shiva and symbolizes Mount Kailasa, the heavenly abode of Shiva. Nam taking a break on an ancient Khmer windowsill. Taro kicking it on an ancient Khmer stoop. 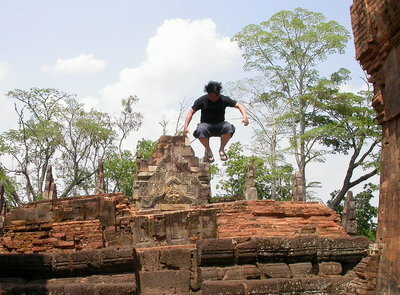 That’s me practicing ninja jumps over ancient Khmer walls. 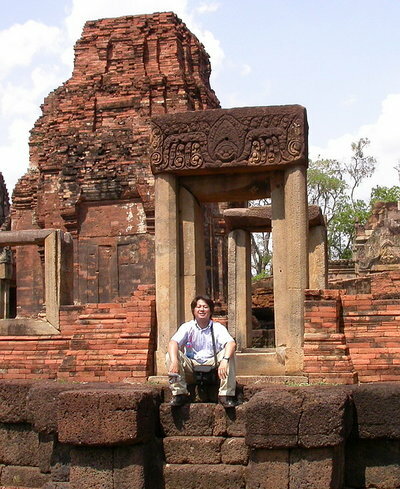 Me and my baby… in front of ancient Khmer ruins. Ah Nam still as beautiful as ever. And yes J and T you guys are still just as hot! I’m so glad to see those ruins and not have to sweat it out in the hot, hot sun! Is it ever temperate and tolerable there? When? Apparently January is the coolest – Nam says it even gets “cold.” I think I’ll be saving money on sweaters, though.